A monocyte is a type of leukocyte produced in the bone marrow from precursor monoblasts and usually circulates in the bloodstream for 1 to 3 days before clustering in the spleen as reserve or entering tissues and maturing into macrophages or dendritic cells. 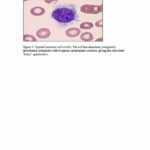 They usually constitute 3 to 8% of circulating leukocytes. Monocytosis is an increase in the number of monocytes circulating in the blood, with a level above 950/microLiter usually considered elevated. In patients with a normal leukocyte count, differentials with equal to or greater than 10% monocytes can also be considered monocytosis. The differential diagnosis is broad, as monocytosis is not representative of a specific condition. It is often a marker of chronic inflammation, either as a result of infection, autoimmune disease, blood born malignancy or possibly even a lipid storage disease. Common infections causing monocytosis include tuberculosis, subacute bacterial endocarditis, syphilis, protozoal or rickettsial disease. Common autoimmune diseases in the differential include SLE, rheumatoid arthritis, sarcoidosis, and inflammatory bowel disease. Malignancy, especially monocytic leukemia, should always be investigated in a patient with monocytosis and appropriate symptom features. Monocytosis can also develop during the recovery phase of an acute infection, recovery from granulocytosis, or be representative of extremely rare pediatric conditions, such as congenital agranulocytosis. Finally, monocytosis exists in a chronic, poorly defined idiopathic condition which is a diagnosis of exclusion. All of the above conditions are mere examples, however, as a definitive list would be too broad to cover in this text. History taking for patients with monocytosis is critical in deciphering the meaning of this sign. A thorough infectious history should be taken including fevers, unintentional weight loss, upper and lower respiratory symptoms, bowel distress and abdominal symptoms, dysuria, rashes, travel history, sick contacts, headaches, a sexual history, etc. The symptoms often overlap with those characteristic of malignant or rheumatological diseases, but should also include arthralgias, joint swelling or stiffness, oral or genital ulcers, visual symptoms, easy bruising or bleeding, myalgias, abnormal skin manifestations, night sweats, esophageal reflux or dysphagia, dry eyes or mouth, photosensitivity, Raynaud’s phenomenon, etc. Finally, and perhaps most importantly, a family history for rheumatologic, malignant, or genetic diseases should be undertaken in addition to a thorough past medical history. There is no single maneuver used to evaluate monocytosis, but rather a general approach for infectious or chronic disease should be undertaken. A general exam for infectious causes, especially those of chronic infections, can be used, specifically examining for lymphadenopathy, rashes, genital lesions including chancre, signs of weight loss and cachexia including temporal wasting, seborrheic dermatitis, clubbing, janeway lesions, osler nodes, etc. Petechiae and splenomegaly can be hallmark signs of blood related malignancies, while a proper rheumatologic examination should include all of the aforementioned in addition to joint and skin inspection looking for effusions, inflammation, palpable purpura and synovitis as well as examination of the oral cavity looking for ulcers, and eye exams for dryness or inflammation. Because the differential for monocytosis is extremely broad, there is no single test used in it’s evaluation. A general radiologic and infectious workup should be employed as symptoms and signs dictate. If malignancy is considered, peripheral smears, flow cytometry, bone marrow biopsy, and finally lymph node biopsy can be helpful and diagnostic and may also be associated with an overall leukocytosis with basophilia and eosinophilia and thrombocytopenia. A blood borne malignancy will most likely require a multidisciplinary approach with hematologists in diagnosis. Because monocytosis is a sign of disease with differential so broad, clinical criteria would be too exhaustive to address in this setting. It may be important to distinguish among infectious, rheumatologic, and malignant causes which will probably require elements of history, imaging, and laboratories. While each chronic infectious cause may require specific cultures or laboratory analysis, rheumatologic causes can often quickly be narrowed with a few laboratory tests, including ANA and RF. Malignant causes almost always require bone marrow biopsy with cytogenic analysis. It is difficult to describe wasted tests in analyzing a sign with such a broad differential diagnosis. Ruling out infectious and rheumatologic etiologies remains the hallmark of diagnosis before jumping to malignant causes, and most notably, a premature bone marrow biopsy. A. Management of Clinical Problem Monocytosis. Monocytosis itself is a sign only and does not require treatment. Treatment of the underlying etiology will cause resolution of this condition.